"It's just weird to be, like, in the moment, ya know? And you're singing, and your eyes are closed, and you have this beautiful moment. 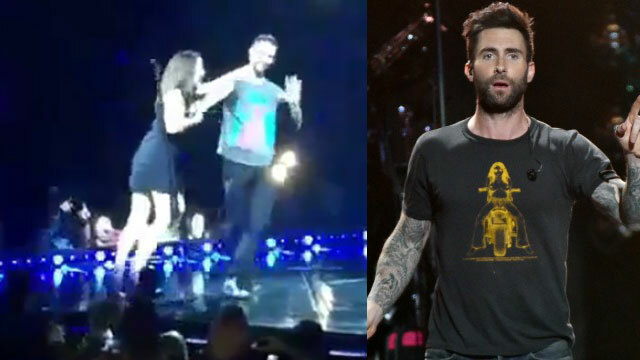 And then the next thing you know someone's f-----g in your face," Levine told the crowd. "It's super terrifying." "The Voice"coach also said that he even got a cut on his ear from the woman's finger nail, but continued the show after the fan had been removed. Concertgoers quickly took to Twitter and Instagram after the event, with many blaming fans like that for added security measures that keep the audience farther from the stage at concerts. Monday's performance was the last North American date on the band's tour before live tapings of "The Voice"begin. Check out the video here for more on Levine's role as a coach on the hit NBC singing competition, including what he and co-star Blake Shelton really drink in their cups during the show.